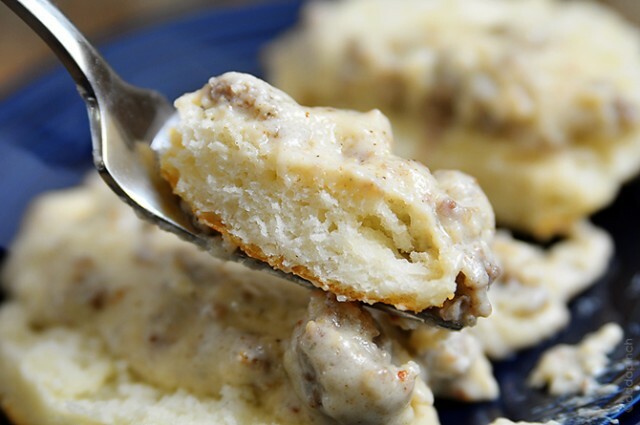 White Sausage Gravy and Buttermilk Biscuits is one of the South’s greatest breakfast treats. Mind you, this isn’t a breakfast we have on a regular basis, but when we need a quick, comforting delicious breakfast that everyone loves, it is one that I turn to. Little Buddy had one of his best friends over Friday night to play on Saturday. Knowing how hard they play all day long, I knew I wanted to fix a breakfast they both would love and that would fill them up for a hard day of airsoft, scooters, and playing on the farm. Without a doubt, the boys (and adults) loved it. 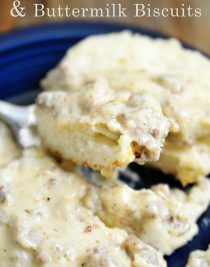 Making a good white sausage gravy takes just a little bit of practice, sort of like making a good pie crust or biscuits. It is one of those recipes that practice makes perfect. After making it a time or two, you’ll learn how to make it just right every time. I remember watching my Grandmother and Mama making gravy as a young girl thinking there was no possible way that I would learn how to make three or four ingredients make something so delicious. But, over time, after a few unsuccessful attempts, I now feel like I could make gravy I’d be proud to serve them. That’s when I feel like I’ve got it just right. 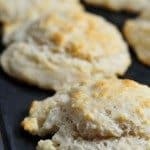 Here’s my White Sausage Gravy and Buttermilk Biscuits Recipe. Make it soon for someone you love. 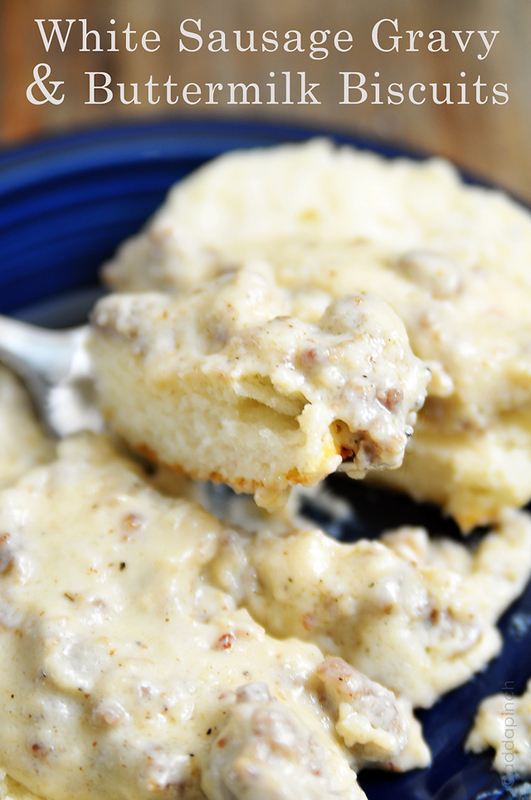 White Sausage Gravy and Buttermilk Biscuits is a true Southern breakfast treat. 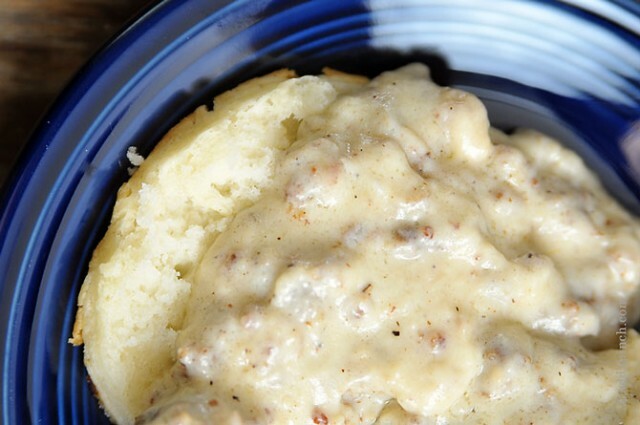 Get this family-favorite sausage gravy and biscuit recipe. Place sausage in a medium, heavy-bottomed skillet. Break apart with a large wooden spoon and cook over medium heat until it crumbles and is no longer pink, about 3-5 minutes. Remove from skillet with a slotted spoon into a bowl and set aside. Remove all drippings except for about 1 tablespoon from the skillet. Whisk in flour into the hot sausage drippings over medium heat until they are smooth. Whisk the milk into the flour mixture in the skillet, whisking constantly until thickened, about 5-7 minutes. Stir in the reserved sausage, salt and pepper. Oh my I forgot to rate this recipe,% stars OFCOURSE!! Oh wow, what an awesome breakfast to wake up too! I actually have never had biscuits and gravy. I know, that is crazy, but my family is not from the south and mom was mostly a pancake or waffle maker in the morning. So I cannot wait to give these a try. They look so good! These look incredible! One of the best breakfasts! This looks delicious! 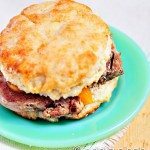 Biscuits and gravy are one of my “all time” favorite breakfast menu items! looks like a PERFECT breakfast to me! This looks so comforting for breakfast! Now I’m totally craving biscuits and gravy for breakfast — yum!!! 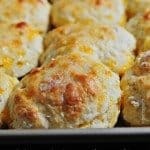 This is the best in breakfast comfort food!! I love Sausage and Gravy! Yum; just made this and my kids (and me too) gobbled it up!! Biscuits were very good. I gave it 3 stars because I thought the directions for making the gravy were a bit out of order. Before becoming a Mr. Mom I was a cook for several years and I have never heard of adding the floor to the fat before working in the milk. I tried it your way and spent 22 minutes working the lumps out of the floor while slowly adding the milk. I hit up a few of my friends who are still cooks and chefs and they all had the same input. 7 of them tried it, tow in the kitchens they work in after hours. They all had the same result. Tried it a second time with milk first, then slowly adding in the flour. Trying the reverse method yielded better/much faster results. My only other critique is that unless you use a heavily spiced sausage the gravy is rather bland and pasty tasting. So glad you enjoyed the biscuits! I’ve never made gravy or watched anyone prepare gravy where the flour and fat were not browned before adding in the cream or milk. Of course, I’m a home cook who does not cook in a professional kitchen, so I’ll defer to you for what is expected from a professional cook. Just wanted to reply to your findings on making gravy as Robyn’s recipe states. I am a professional chef and a southern woman and was taught by my mother who was taught by her mother how to make southern white gravy. Four generations of cooks never had a problem preparing gravy this way. This white gravy is basically a Bechamel which starts by making a roux and the reason you add the flour to the oil first is to cook the raw flavor out and add that flavor you said was missing. This recipe brought back many happy memories for myself and many others I imagine. i was raised in the south. my take: she didn’t add enough fat. you want enough fat so the flour, when stirred into it, is fluid enough to move around. do this on medium heat. you don’t want it to brown too quickly. if its dry looking, not enough fat. it almost takes a 1:1 ratio of flour and fat. brown it for a bit, about a couple minutes. then whisk in the liquid and continue to stir. when it bubbles turn heat to low and whisk. cook like this for about 5 minutes.add lots of black pepper and maybe a pinch of sage. best ever. i have used a flour/milk roux also. either tastes good but the fat/ flour roux is easier for me. I love sausage and cream gravy as I call it. I make mine just like you, comes out perfect every time! I am a home cook also and learned from the best, my Mother. Love some good gravy and biscuits!! Pinning! !